According to body language experts, a strong handshake shows confidence and portrays your interpersonal skills. These personality characteristics are key for recruiters who are searching for new employees at career fairs. As a student at a career fair, its sometimes nerve-wracking to meet with recruiters. You’re busy thinking about your elevator pitch, answering their questions, and learning more about the company. However, all of this comes after you introduce yourself and reach out for a strong career fair handshake. Reach out first! No matter where you stand on who should make the first move in the dating scene, it’s important that you make the first move for a handshake at a career fair. Initiating this contact first shows a future employer you possess the confidence they are looking for. Eye contact is key. As you’re reaching out for the handshake, make sure you lock eyes with the recruiter, as not making eye contact during a handshake signals the other person that you are not interested. Get a grip. Once you’ve locked eyes, it’s time to lock hands. The secret to a strong handshake is a strong grip. Put your hand out, tilt your fingers down and lift up into the handshake. This technique allows you to get full palm-to-palm contact. Firmly grasp the other person’s hand, avoiding flimsy wrists in your handshake. Keep it short. After securing your grip, give your handshake just one or two pumps. 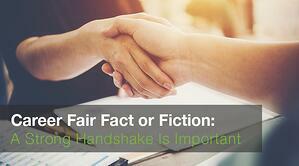 This short and sweet handshake shows your confidence but does not leave you lingering with any awkwardness. Don’t forget, recruiters are eager to speak with you but are also very busy at career fairs. A strong career fair handshake is crucial, but as we mentioned at the beginning, it’s not the only thing that students have to keep in mind. Your parents always told you to stand up straight - and they were right. Slumping or leaning over does not exude the poise and tenacity that an employer looks for. When walking around the career fair or meeting with a recruiter, remember to keep your shoulders back and stand or sit up straight. Dress to impress! Be sure to select an outfit that is appropriate for a career fair. Professional dress is a necessity to be taken seriously by a recruiter. Learn more on what to wear to a career fair. One of the most nerve-wracking parts of going to a career fair is the elevator pitch. Talking about yourself and your accomplishments is hard enough, but putting it all into 30 seconds is even more difficult. When preparing for a career fair, make sure to rehearse your elevator pitch several times.